The Ministry of Defence has been criticised over its failure to dispose of 20 obsolete nuclear submarines.Nine of the vessels still contain nuclear fuel, according to the government spending watchdog, the National Audit Office (NAO).Failing to get rid of them risked the UK's reputation as a responsible nuclear power, the chairwoman of the Commons Public Accounts Committee said.The MoD said it would dispose of them "as soon as practically possible". Meg Hillier, chairwoman of the Commons Public Accounts Committee (PAC), said the MoD must "get a grip" of the "spiralling" costs to the taxpayer. "For more than 20 years the MoD has been promising to dismantle its out-of-service nuclear submarines and told my committee last year that it would now address this dismal lack of progress," she said. "The disposal programmes have been beset by lengthy delays and spiralling costs, with taxpayers footing the bill." By Jonathan Beale, BBC defence correspondent This report is a sober reminder of the expensive legacy costs of operating nuclear powered submarines, and not just building them.The MoD currently plans to spend about ?40bn on four new nuclear powered submarines - the new Dreadnought class - to carry Britain's Trident nuclear weapons.But it still hasn't safely disposed of the four Resolution class submarines that were designed in the 1960s and that once carried the old Polaris nuclear missiles.The National Audit Office report is also a reminder of the added costs of delaying difficult decisions. Since 1980 the MoD has spent ?500m just to store and maintain its obsolete submarines while it works out how to safely dismantle them.The MoD's future liability for maintaining and disposing of the 20 decommissioned submarines, along with the 10 now in service submarines is ?7.5bn.And that is likely to rise, only adding to the pressures on a department that's already struggling to live within its means. 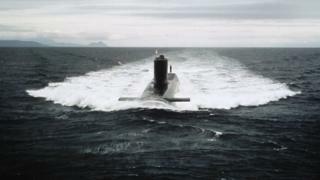 The report is the latest in a string of warnings to the MoD over its finances, with the PAC in February calling the MoD a "repeat offender" when it came to "poor financial planning".The nuclear vessels being stored include the first submarines used to carry the UK's nuclear deterrent: the HMS Revenge, HMS Renown, HMS Repulse and HMS Resolution. Attack submarine HMS Conqueror, which sank the Argentine cruiser General Belgrano during the Falklands War, is also in storage. No submarines have been defueled since 2004, when regulators said waste-disposal facilities did not meet the required standard.The process is not set to begin again for another four years.An MoD spokesperson said: "The disposal of nuclear submarines is a complex and challenging undertaking. "We remain committed to the safe, secure and cost-effective defueling and dismantling of all decommissioned nuclear submarines as soon as practically possible."